The tannins in black walnut are also thought to encourage the elimination of unwanted microbes in the colon. Herbalists believe that the acidic nature of tannins make life miserable for the alkaline loving yeasts and microbes that can infect the bowel. Beneficial flora like lactobacillus acidophilus seems unaffected by the presence of tannins. Black walnut is considered to be an antiseptic, a germicide, a parasitic, and a laxative. It helps with a variety of health conditions from ridding the body of intestinal parasites and tapeworms, to reducing constipation and healing skin conditions. 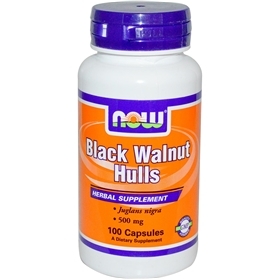 Black walnut is helpful for acne, canker sores, psoriasis, and other fungal infections. Suggested Use: As an herbal dietary supplement, take 1 capsule 2 times daily with meals.